Galley Hill, Greenleys. 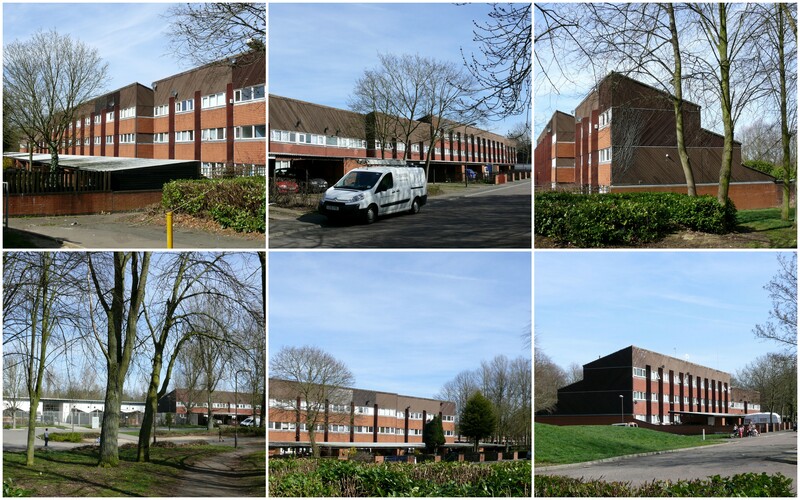 Early Housing in northern Milton Keynes. 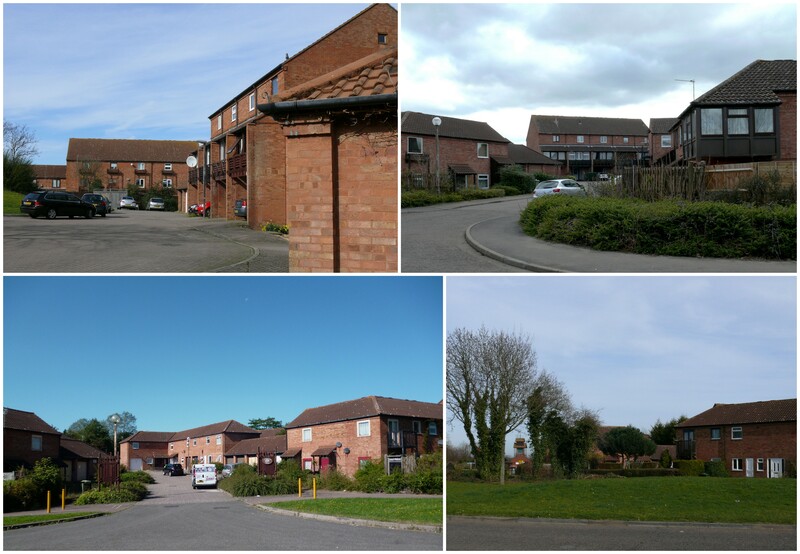 Galley Hill was one of the first large housing schemes completed in 1971-72. At this point the problems of overheated building industry became apparent. 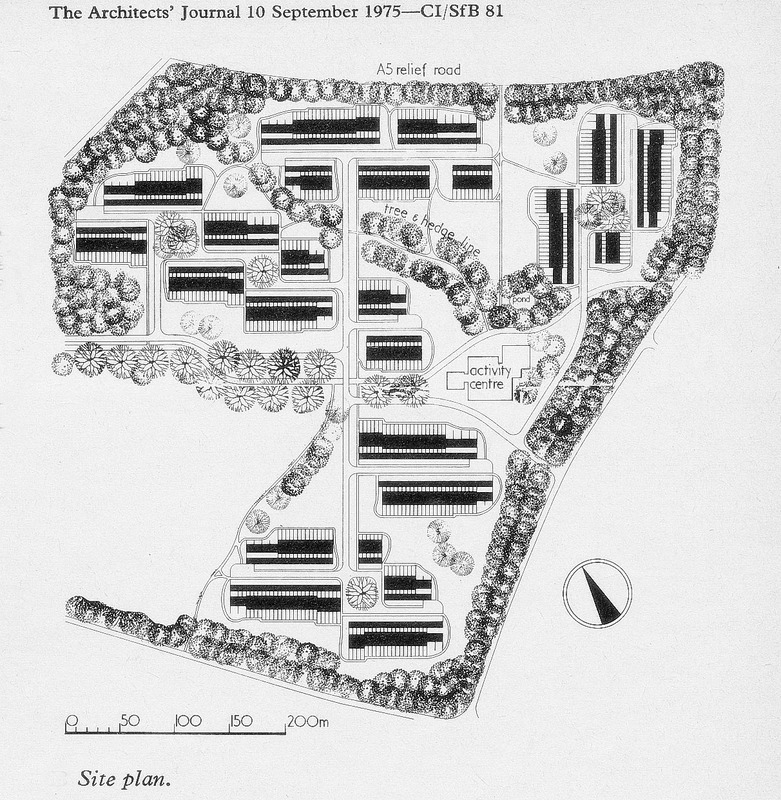 The required speed of building new houses was not available and to meet the requirements, simpler layouts were needed along with the introduction of industrialised methods of construction whenever possible. The small groups of terraces forming the public spaces were treated in fairly homogeneous manner as far as use of colours and finishes of horizontal boarding and design of doors and windows was concerned. 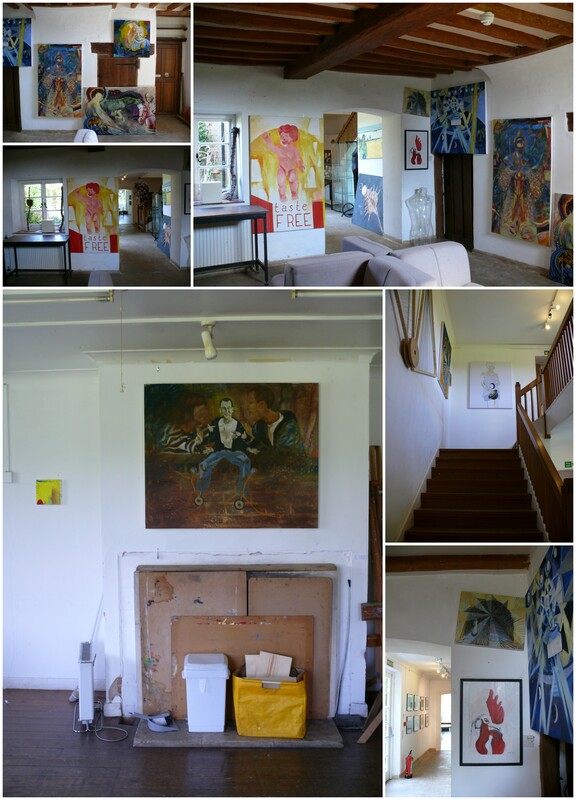 However, as happened in other places, the subsequent private ownership of a large number of houses ensured an introduction of patch work of varying colours and materials to display individuality of their new owners, weakening the architectural coherence originally envisaged. 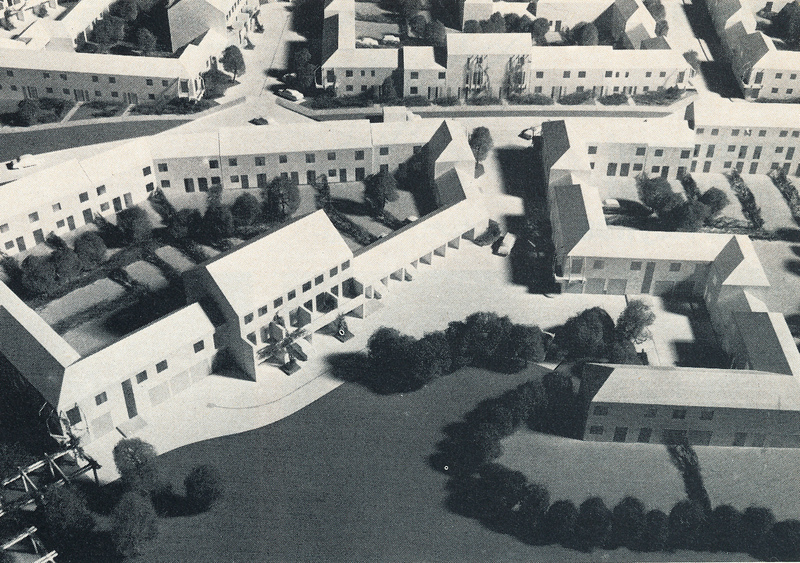 The pitched roofs helped in many ways – disasters of leaking flat roofs of southern flank housing schemes were not experienced and roof scape also helped to unify the appearance. 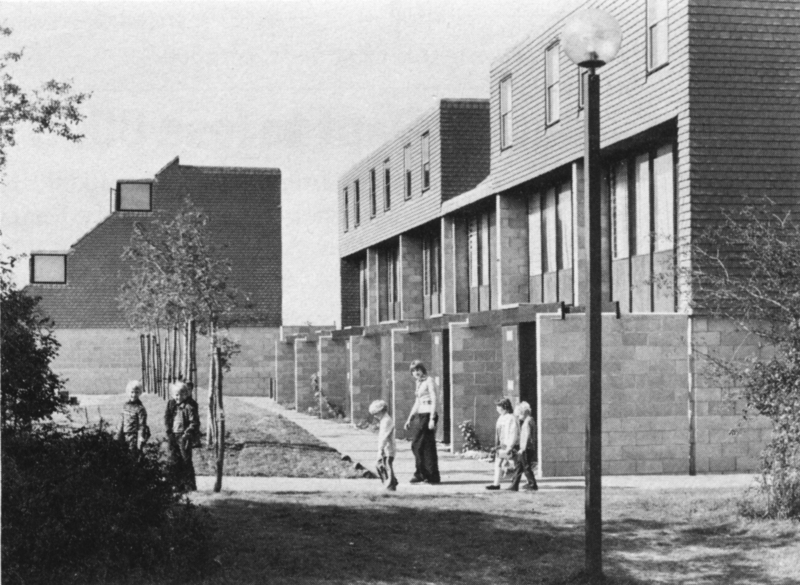 The densities were low and compared to modern housing developments these Parker Morris standard houses and large open spaces look almost lavish. 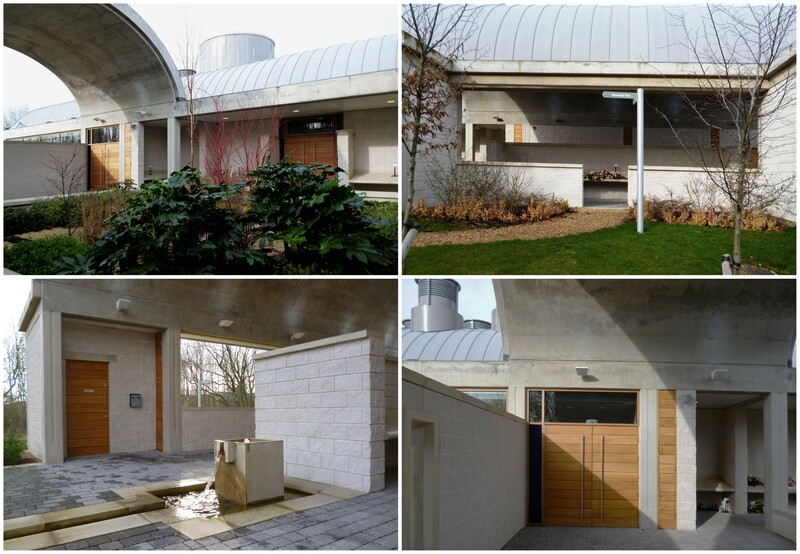 Buckinghamshire County Council was responsible for designing and building schools in Milton Keynes and one of their gifted architects, Brian Andrews, worked closely with MKDC planners to build a traditionally built school closely integrated with the roads and footpaths. 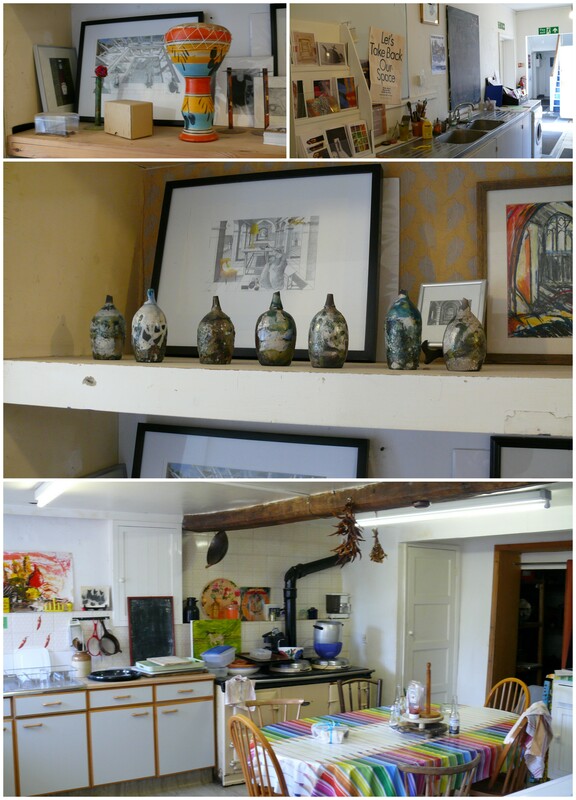 There was some bold ‘arts and crafts’ inspired brick detailing and a friendly open layout. Unfortunately the subsequent vandalism has meant that fences and gates have denied easy access. 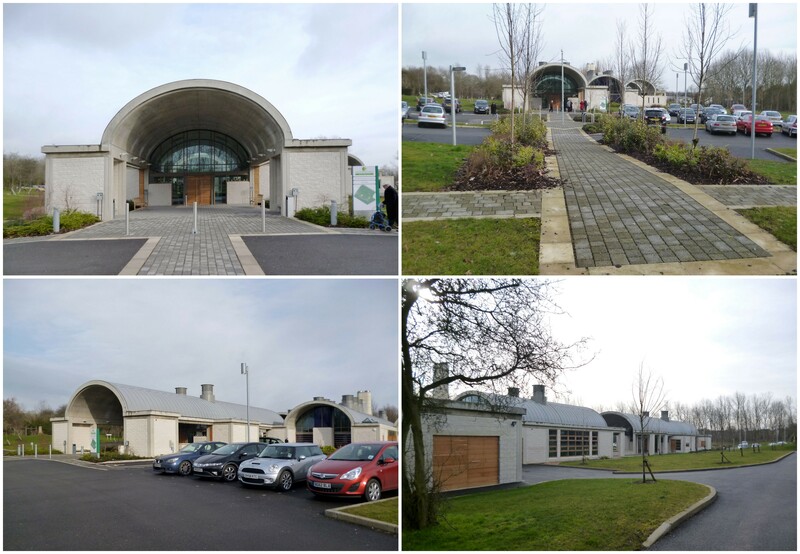 Greenleys housing is more formal, using car free courtyards on either side of car parking areas or courtyards large enough to bring cars into attached garages and car parking spaces. 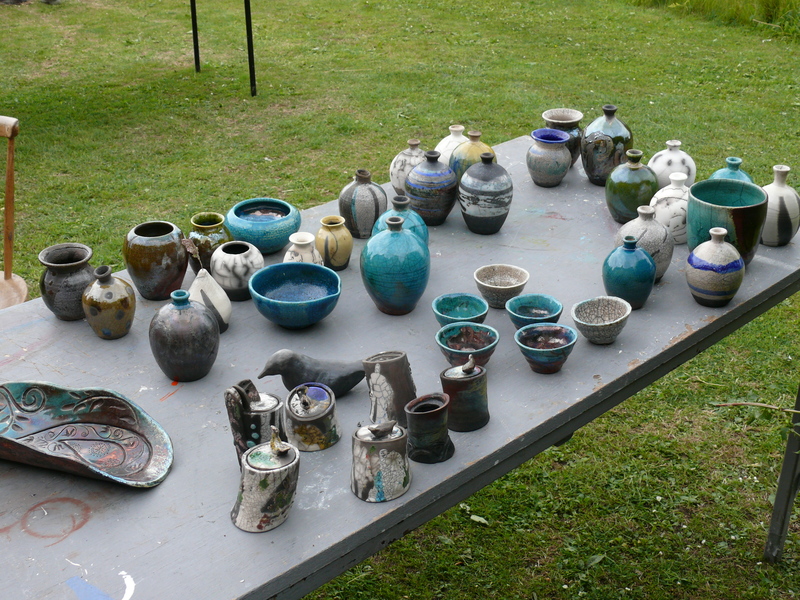 These schemes were worked out and built fairly quickly. 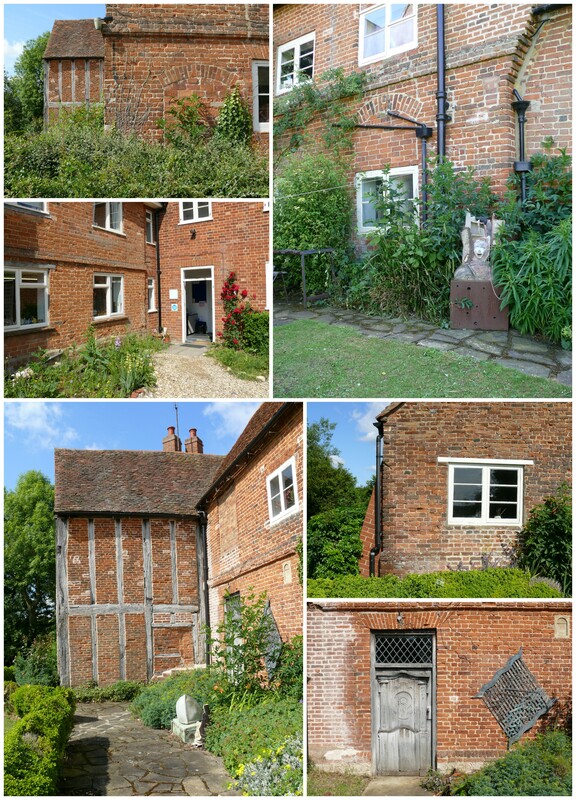 The warm coloured bricks and pitch roofs were also a far sighted decision for this period. Landscaping, as usual is of high standards unifying the whole scheme. 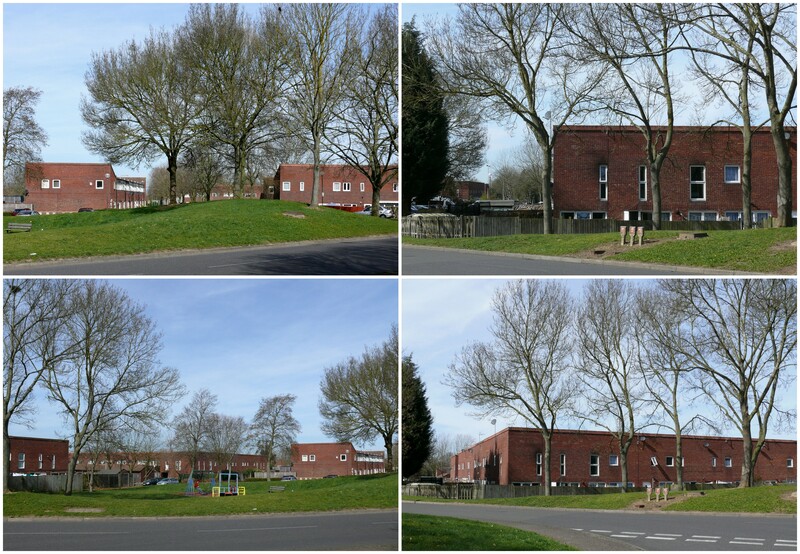 Buckinghamshire County Council built another traditional looking school here. 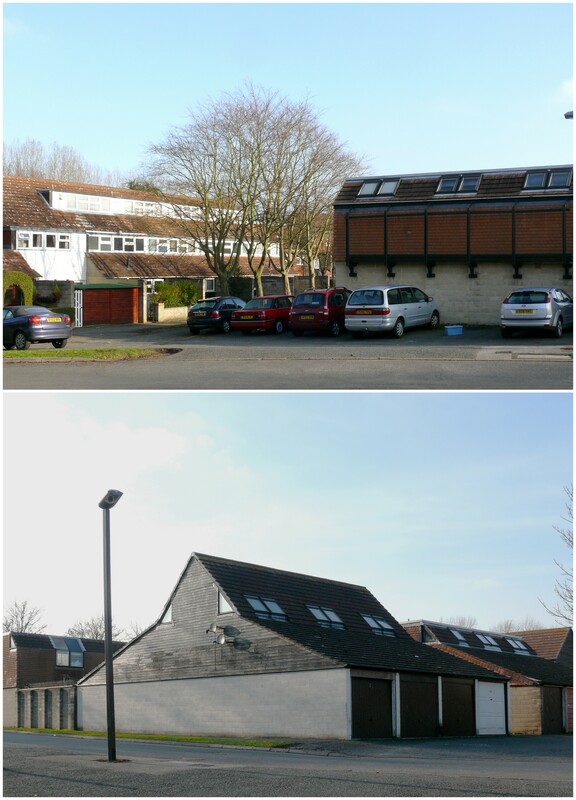 Ivor Smith built the Local Centre with Community and Sports facilities at low level and housing above. 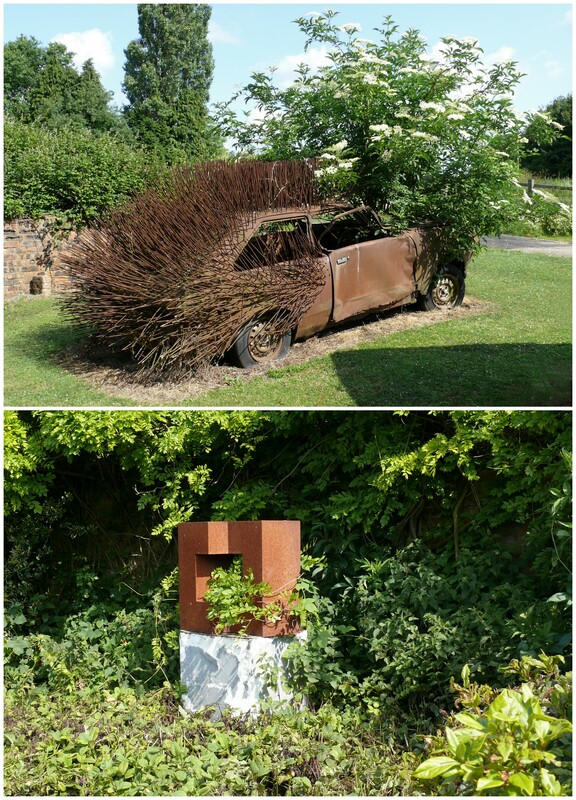 Both are shown in the photograph below. 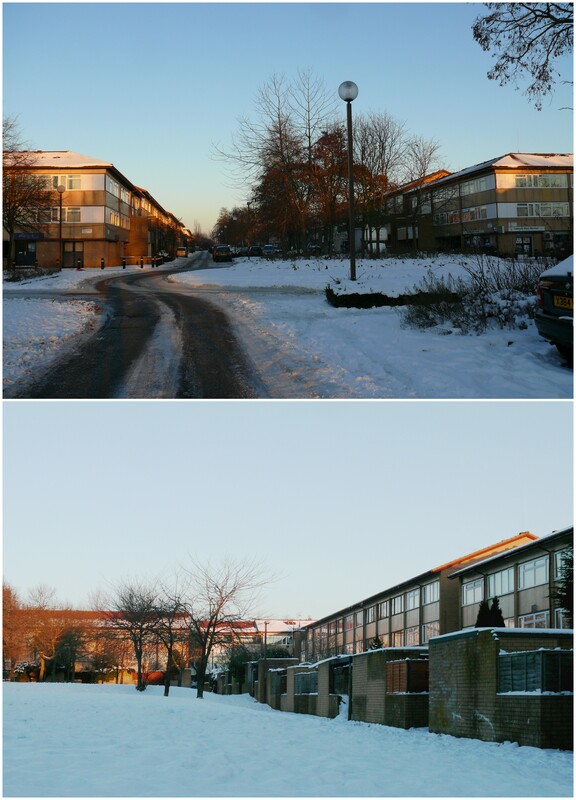 In early 70s, while the large scale housing grids were being developed on southern flank of Milton Keynes near Bletchley (Coffee Hall, Netherfield, Eaglestone, Netherfield have already been covered in my earlier Blogs) northern flank started slightly more cautiously and more traditionally. 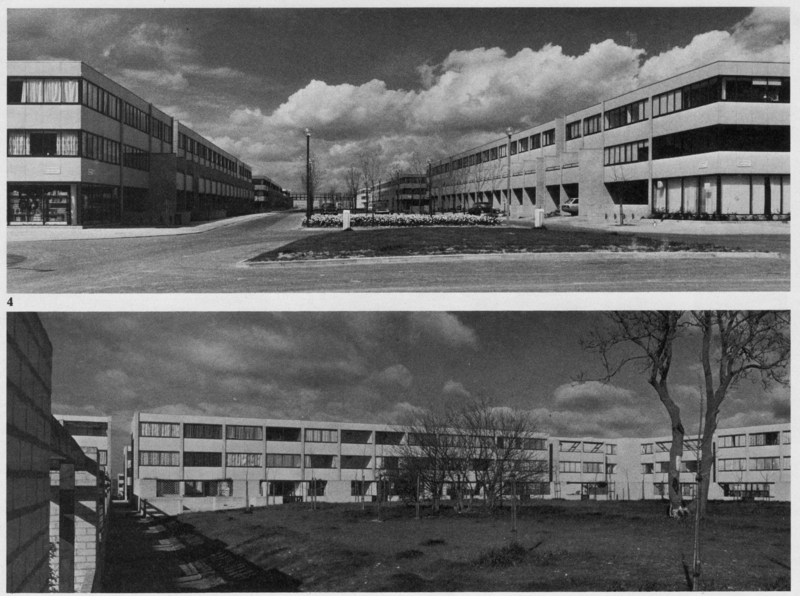 Milton Keynes, was badly suffering from shortage of skilled labour and contractors due to its huge building programme and distances from existing conurbations. 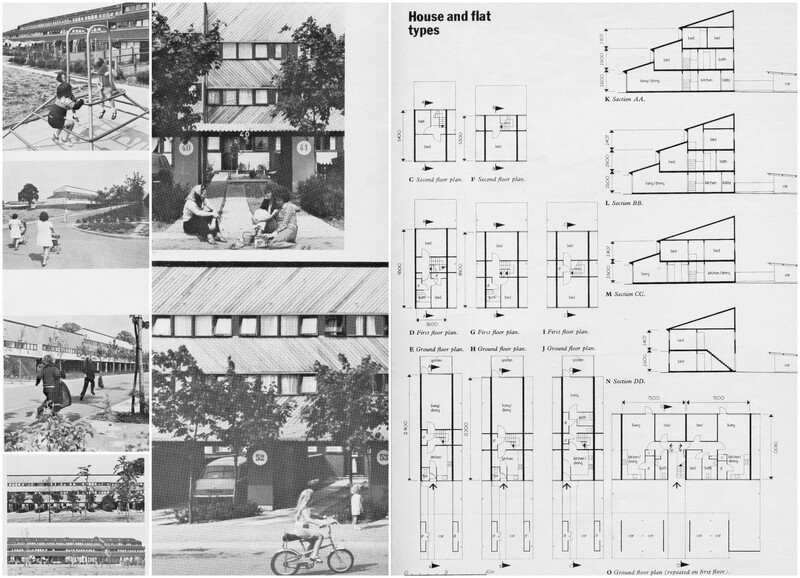 There were attempts to design housing by using simplified and if possible use factory built or repetitive elements of construction where possible. 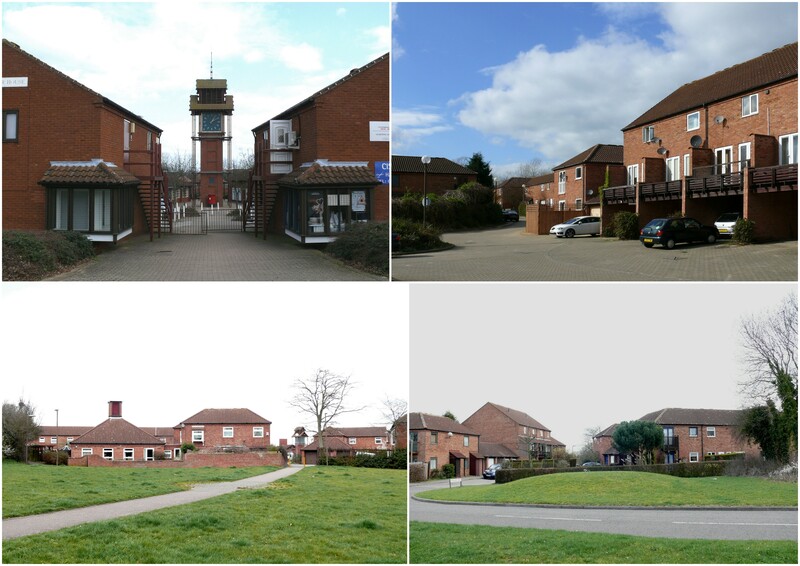 The first housing scheme near Stony Stratford, Galley Hill, was nearing completion and DOE’s granted permission for the same contractor to continue working on Fullers Slade provided the work continued from first site to the second. This imposed a much reduced design period (almost two months) and resulted in a simpler layout and quick decision making. 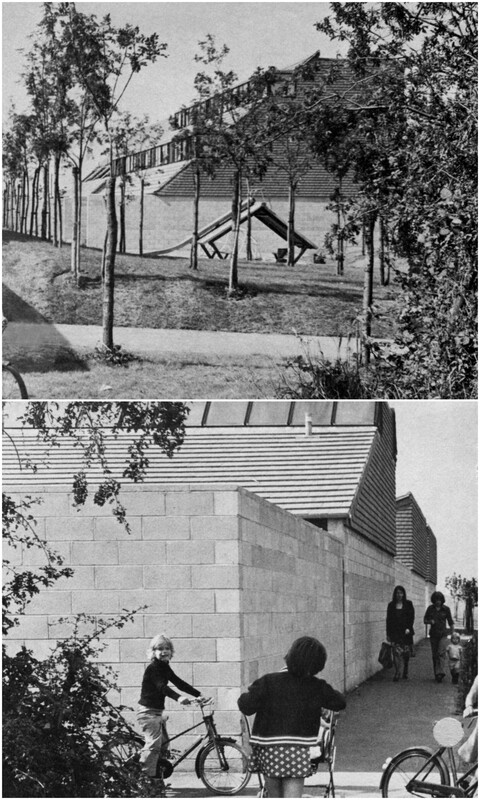 Long delivery periods for bricks made it necessary to use diagonal cedar boarding as external cladding and a concrete system using a box system of shutters was used on a standardised 3.60m module for all dwellings. In retrospect you can notice the direct or indirect influence of Wayland Tunley working with Derek Walker. Pithed roofs and familiar building materials were used whenever possible. 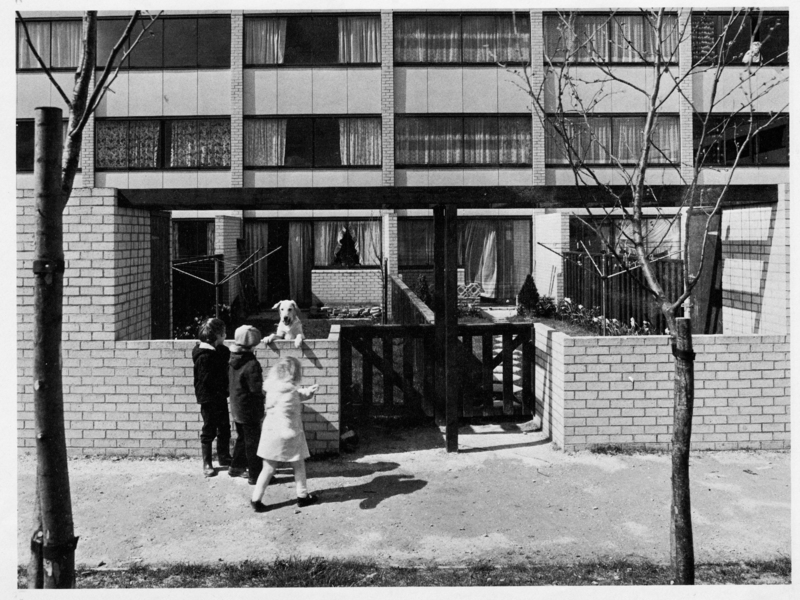 This was in contrast wit Grunt Group’s bold use of flat roofs and metal windows and cladding at Netherfield (Ralph Erskin at Eaglestone performed a similar function) which ran into all kind of technical difficulties and windows and roofs had to be changed to make the dwellings habitable. The decision was taken to use simple terraces with houses of different sizes, generally following the contours of the site. 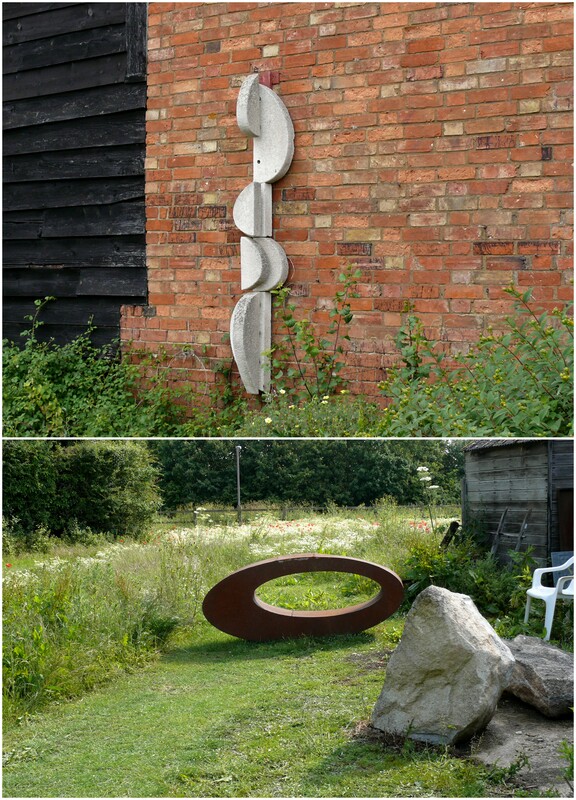 An ancient existing mature hedgerow offered a natural anchor to the generous communal spaces around terraces. The stepped section offers maximum living accommodation on the ground level and daylight within the units also allowing sun to reach the private garden positioned on north-east side of the terraces. After about 40 years use. As usual the landscaping is wonderful. Some of the large trees perished during Dutch Elm disease but others were planted. Unlike unfortunate disunity/disfigurement/multi-colour additions and ad hoc alterations to individual houses within the terraces of Netherfield, it is a relief to notice that there is a satisfying unity of colours textures and window designs despite quite a few major alterations to exterior design at Fuller Slade. I read quite a few reports about fire incidents in local newspapers of Milton Keynes (unfortunately social housing schemes are often involved), I can only assume that the possibility of spread of fires with timber boarding and lack of vertical barriers may have added to this problem and perhaps explain the resulting changes. The clay tile hanging has replaced the timber boarding between the window bands, simple (and controlled coloured) fins have appeared between dwellings. There is a relaxed and easy going use of car ports, stores and sheds which are often modified but are not offensive by any means. Children and families enjoy the public spaces in a safe and relaxed environment. I must find out the reasons for this positive use after seeing the terrible failures in housing in other areas. This may be due to different ‘owner occupation’ ratios or the imposed rules on the new occupiers to conform with some acceptable communal responses to retain some visual unity. 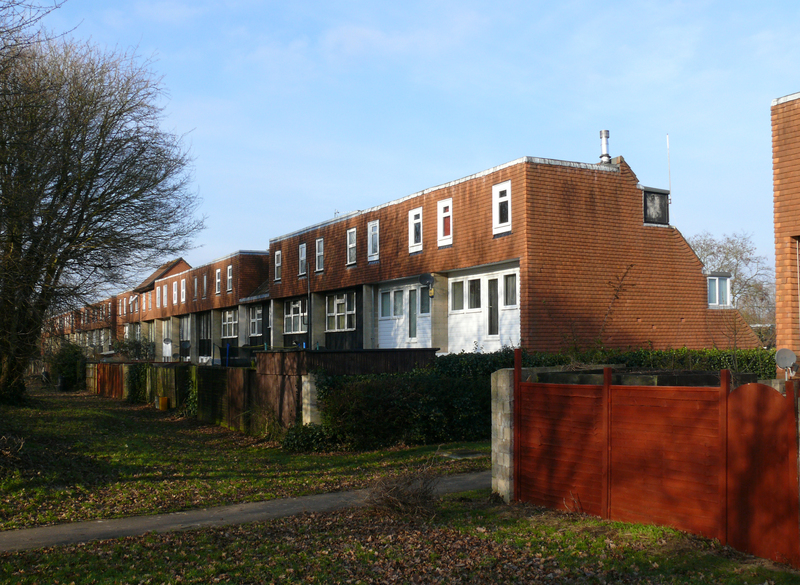 It is also possible that there is a large proportion of dwellings under a housing association control which carries out its own maintenance. 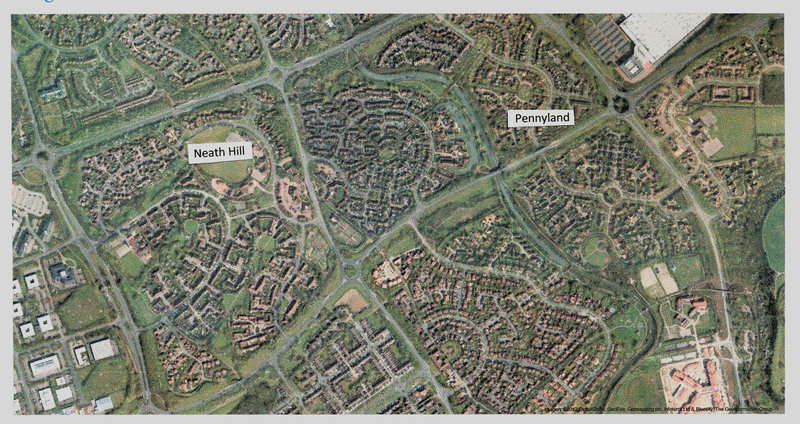 There is no doubt that the north and south divide has some lessons to offer in Milton Keynes. 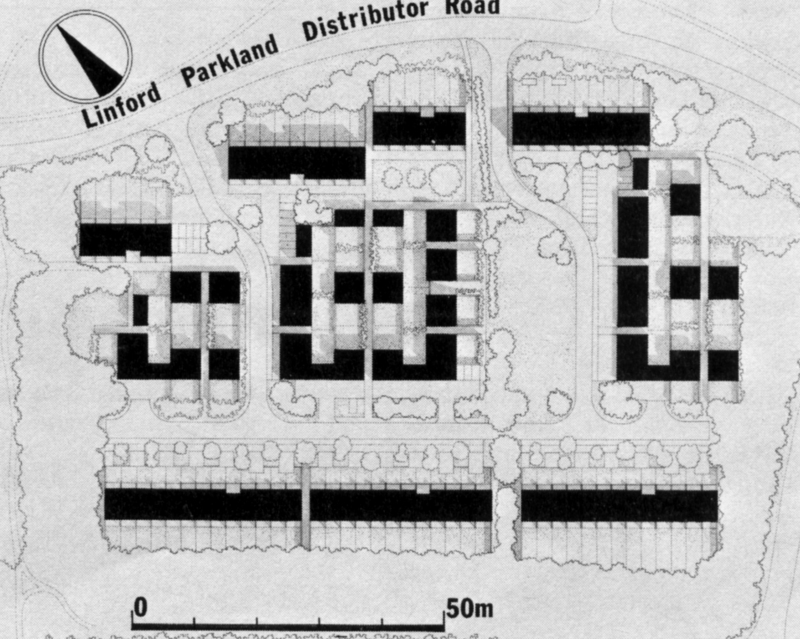 For some strange reasons Linford Grid managed to produce more successful housing schemes than many other grids developed at the same time. 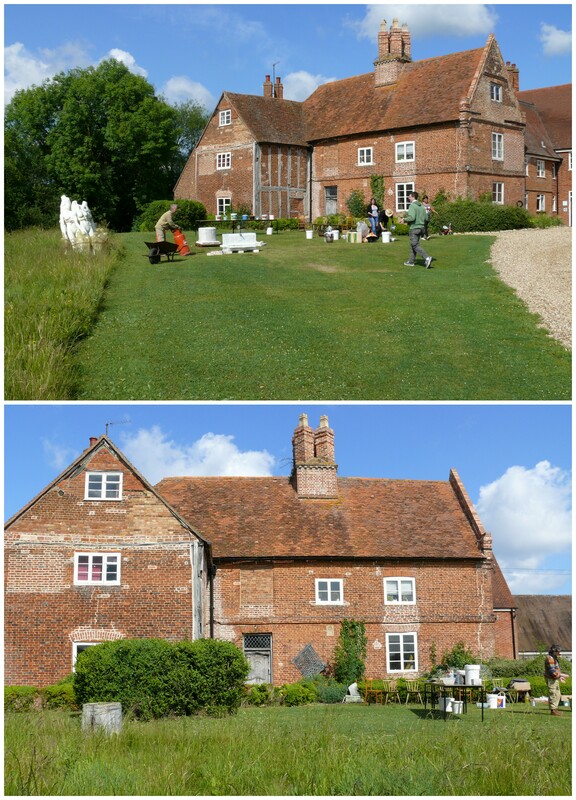 This may be partly due to small parcels awarded to better known architects and possibly due to abundance of existing trees and hedges and some notable existing village buildings. 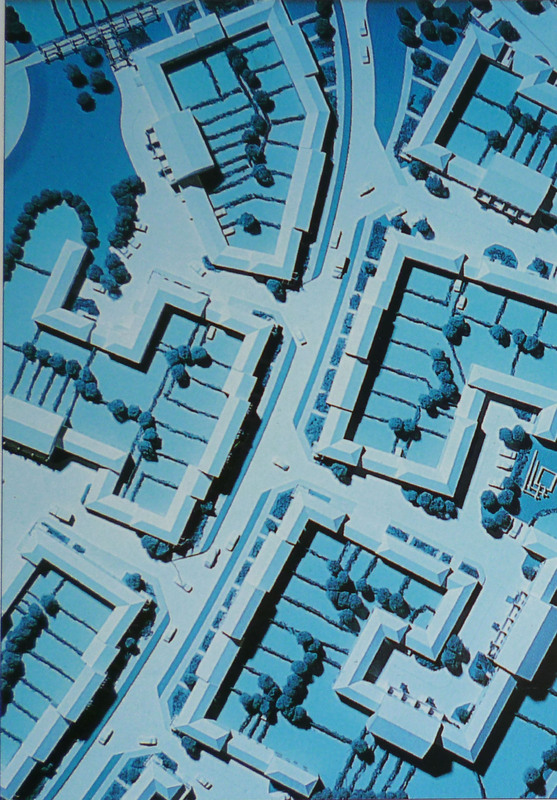 This scheme by Brian Frost for 113 housing units in terraced and courtyard houses was like most schemes designed for rental housing and once again has mainly ended up in private ownership with all associated problems damaging the architectural unity of the original scheme. The strength of terraced houses around the edges of the site is as powerful as ever despite the bruises and unfortunate alteration occasionally ruining the roof line and fenestration rhythms. The local planning office must take a more rigid line to stop this damaging process in most early housing schemes specially designed as unified communities which is gradually being destroyed. 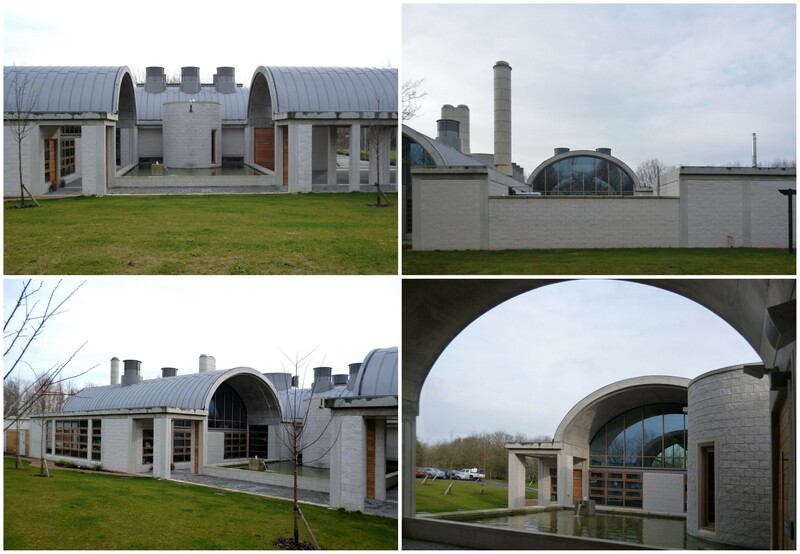 The fair-faced concrete walls are still looking good and some inventive roof extensions in courtyard housing are logical and witty. The damaged soft clay vertical hanging tiles are easy enough to replace but the ownership problems are stopping even this to be carried out in most places. 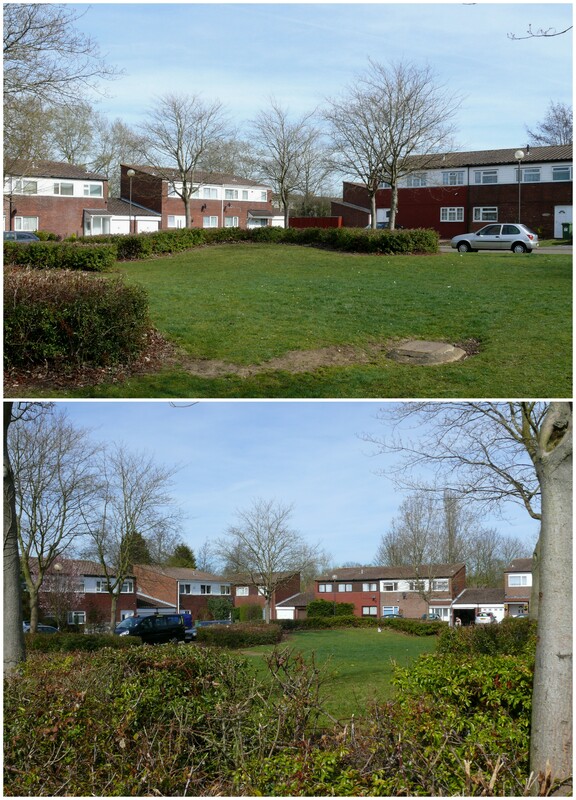 The quality and variation of external spaces and circulation with good landscaping still retains the coherence and yet again proves that good intelligent, creative designs are street ahead of acres of soul-less Barratt/Wimpey type mass production of mediocrity currently sweeping the city and even the country. 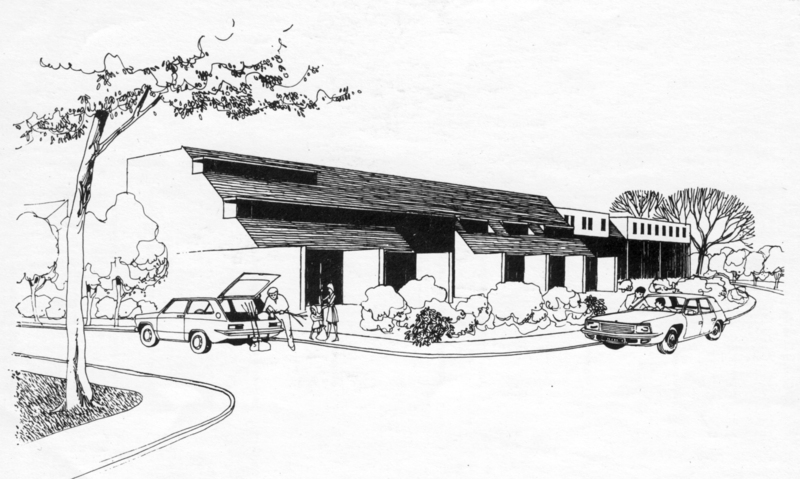 The plans and B&W photos are attributable to AJ 23 January 1978. B&W photos by John Donat. The colour photos were taken recently. 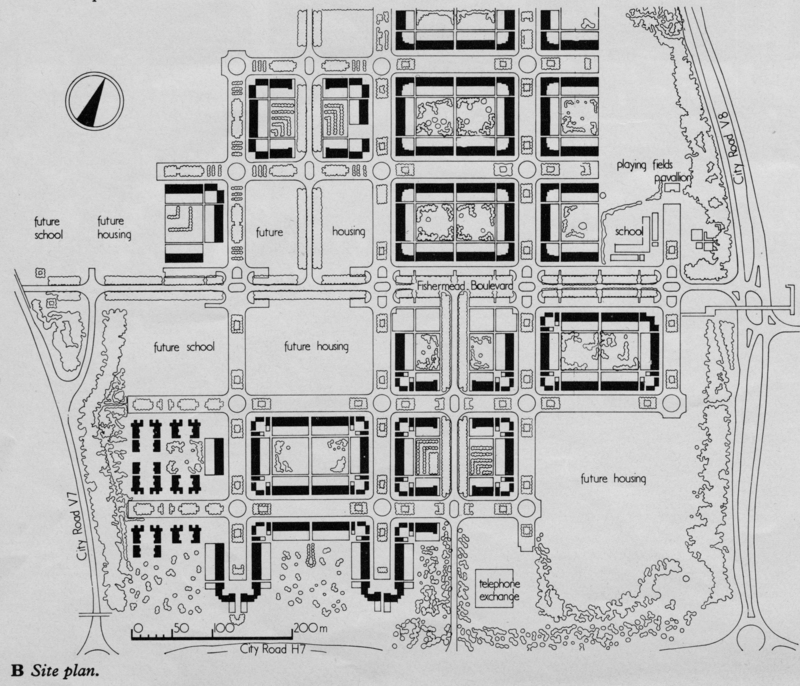 This series hopes to cover most of the early significant housing in the new city in its early days of development. 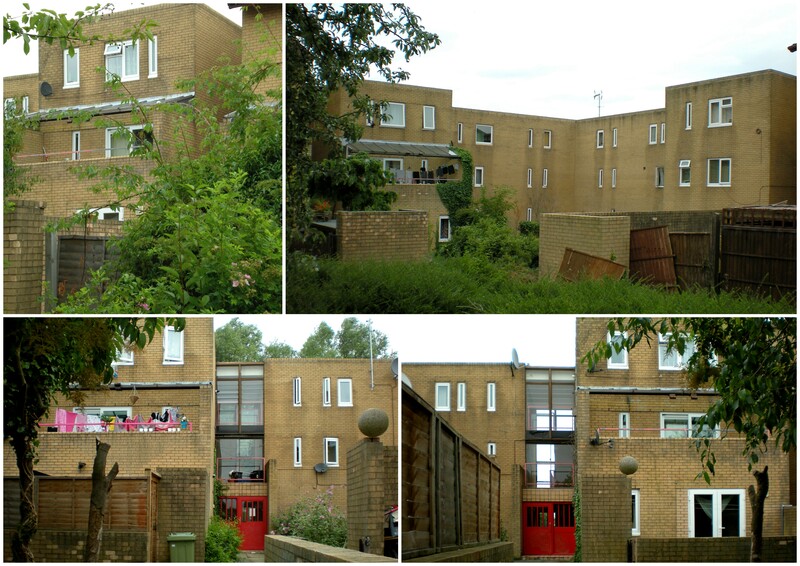 Fishermead 1&2, Early Central Milton Keynes Housing. 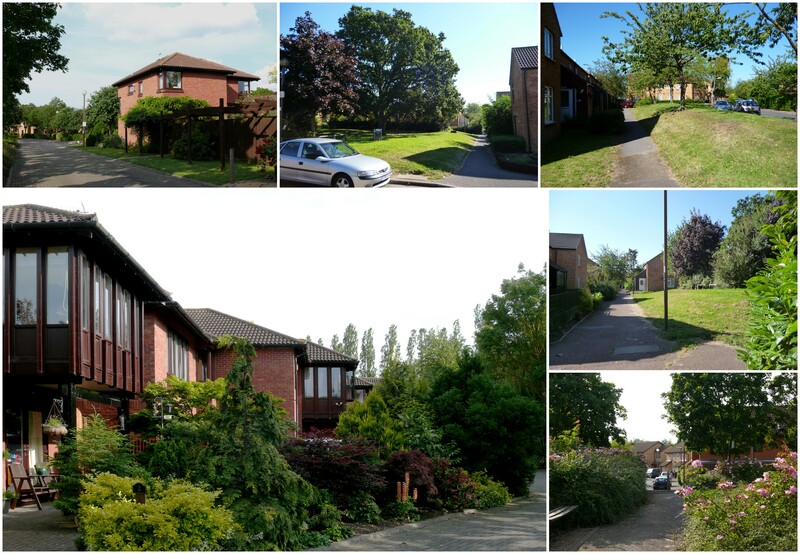 The story of early housing in Milton Keynes now looks at Central Milton Keynes grids with higher densities. 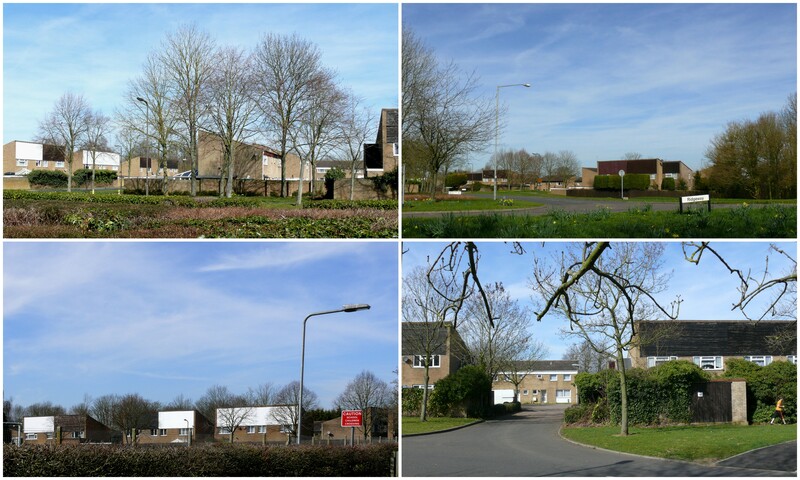 Fishermead was developed at a higher density than that of housing in other areas of Milton Keynes. 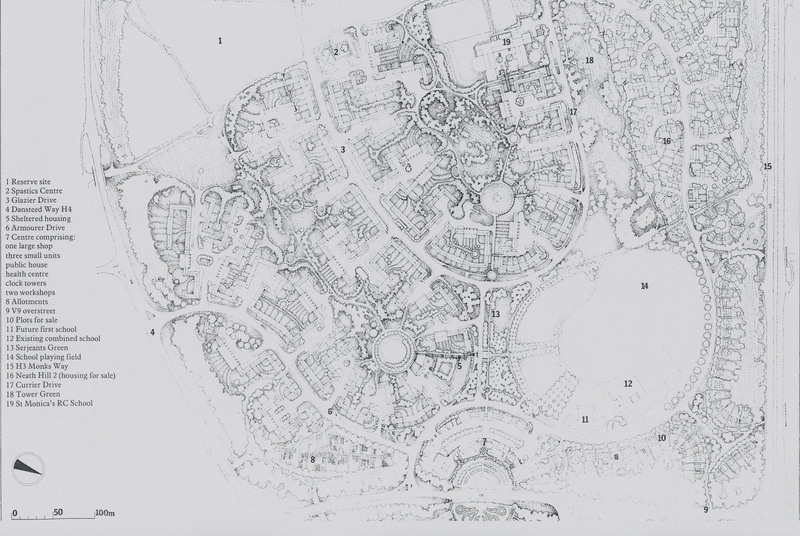 In this scheme the residential density range is 219-224 people per hectare. 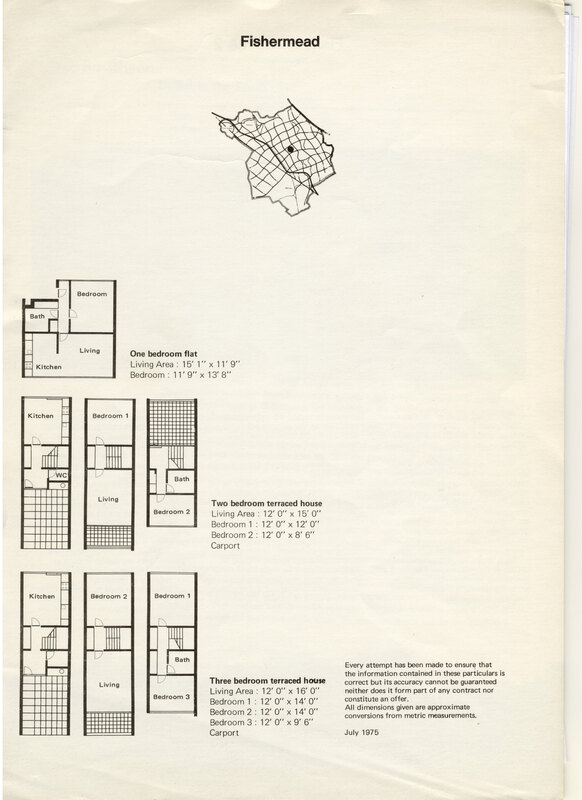 The result provides an interesting comparison with the draft government circular published in 1966 which suggested that the suburban densities could be raised to 120 persons per hectare where appropriate. 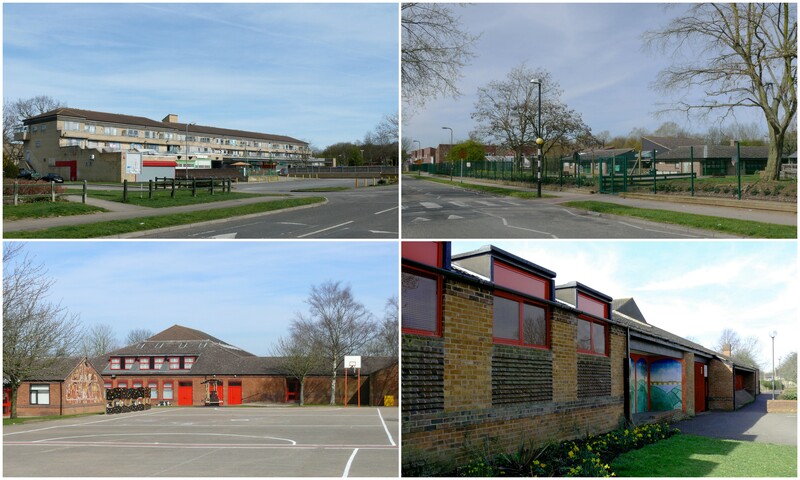 The Central Area consisting of nine grids including Fishermead was to house approximately 30,000 people, together with related local commercial, social and educational facilities. At the time of inception 75 % of dwellings were designed for renting and 25% for sale (this proportion is possibly reversed by now). 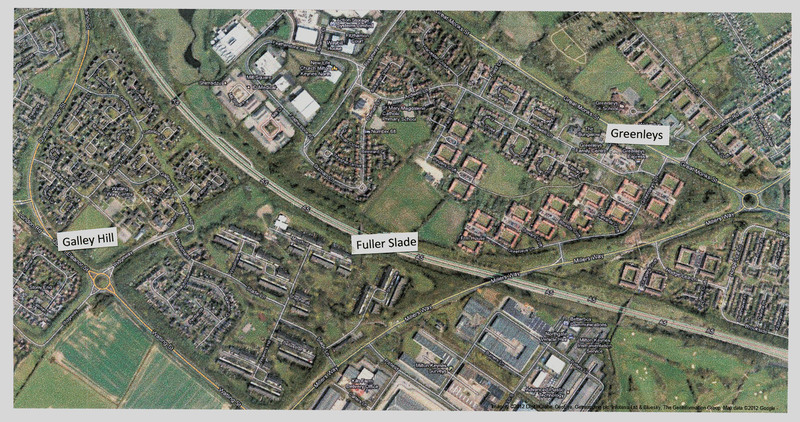 Various reserved sites were retained for future growth and possibility of change. 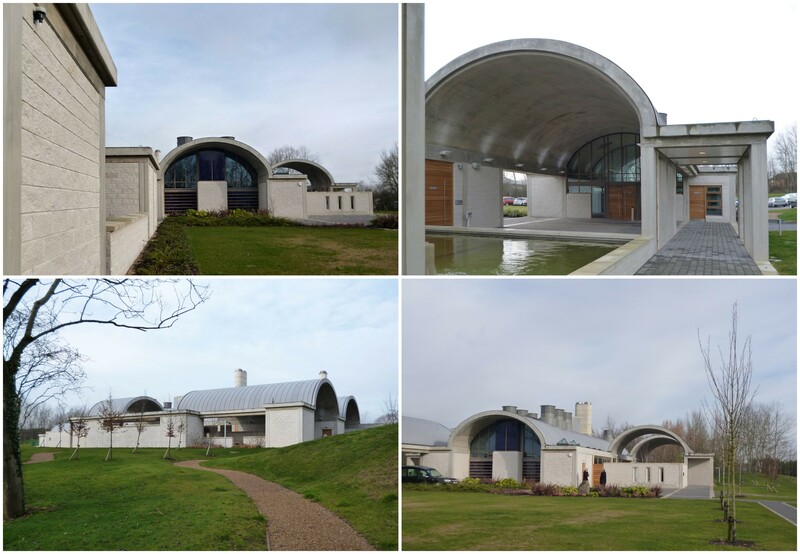 Because of the flexibility in the structure plan, it was hoped that the continuity, growth and change could be accommodated consistently rather than fortuitously. 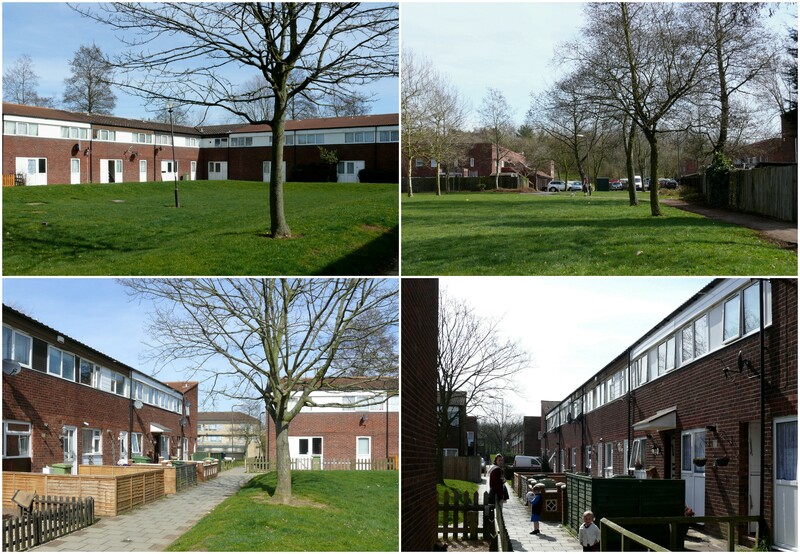 The predominant housing form is three-storey perimeter development around the edges of 180 x 130 m grid enclosing semi-private spaces which are directly accessible from the gardens of the surrounding houses. These spaces provide protected, safe areas for toddlers’ play, sitting areas and landscaping. The back gardens opening into these spaces were originally designed with little visual protection resulting in under use due to lack of privacy but at first opportunity timber and brick walls started appearing almost excluding the visual connection between home and the landscape space in the middle. Architects realized the need for privacy in these higher densities and the fencing for 2nd phase offered more privacy to the tenants. 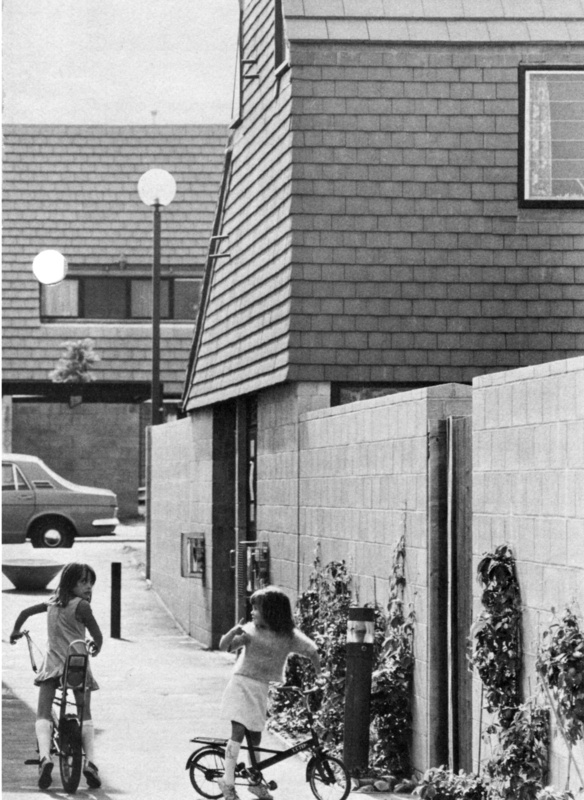 Family houses are built in terraces along the streets and the smaller dwellings are accommodated in corner blocks. Space is reserved at each corner to provide for possible future community use: shops, office, residents’ club room etc. 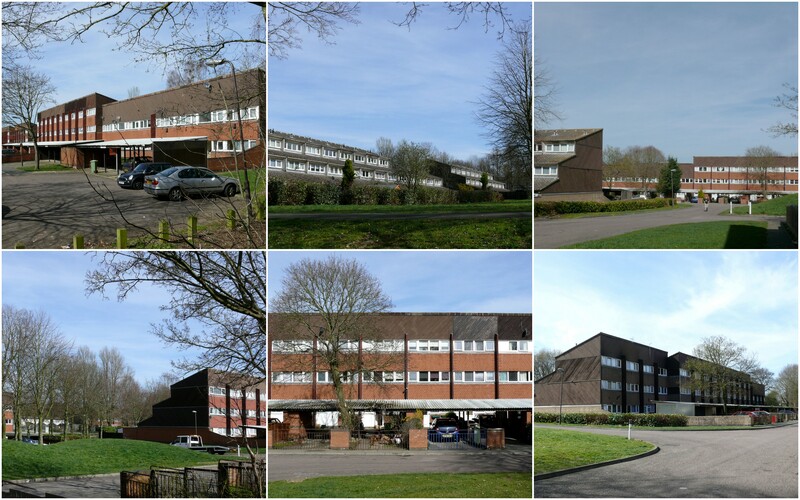 If you have seen my previous Blogs on early grids of Milton Keynes, you would have noticed there are lots of common factors at work to make this look like a ‘deprived’ estate. At one time the property prices were rock bottom and people were not prepared to live here unless there was no other available option. 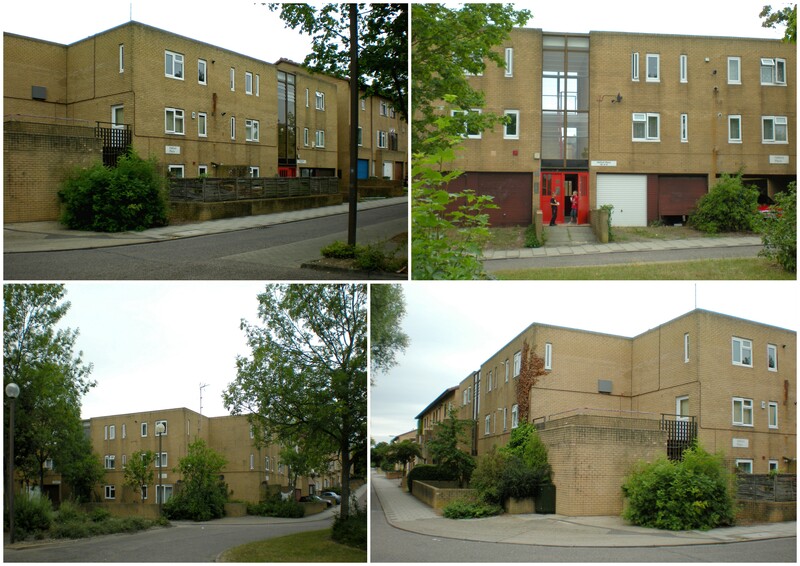 The economical factors have made this estate a ‘honey-pot’ for recent Somalian migrant population in Milton Keynes. The original architectural intentions to obtain flexibility on corner spaces to cater for ever-changing future needs seems to be working. There are thriving grocery shops and fast food stalls in corner locations serving the specific needs of the currently occupying community. This gives a certain ‘cohesive’ feel to the place and in some ways comes quite close to Jane Jacobs’ ideas of communal living. Once again the original dream of housing a burgeoning middle class community with ‘Habitat’ furnishings and ‘comfortable’ living had a head on crash with the arrival of ever-changing disadvantaged communities struggling to survive. If you are prepared to ignore the architects compulsion to follow niceties about correct appearances, colour matching, sympathetic alterations and litter in key positions, you would have to concede that the discipline and the rigour of the original design has done its job differently, but adequately to offer a safe haven to a distant community (among others) whose arrival could not have been further away from the minds of architects of this remarkable office at the time of designing this project. PVC windows are the biggest destroyers of the architectural fabric, closely followed by flimsy asbestos panels as these buckle, fade or get damaged. The age old wish to put personal stamp of ‘ownership’ results in a Netherfield type ‘rainbow’ effect which goes against the intention of the original design. The overhanging eaves of added pitched roofs tend to softens the personal touches and strengthen continuity. 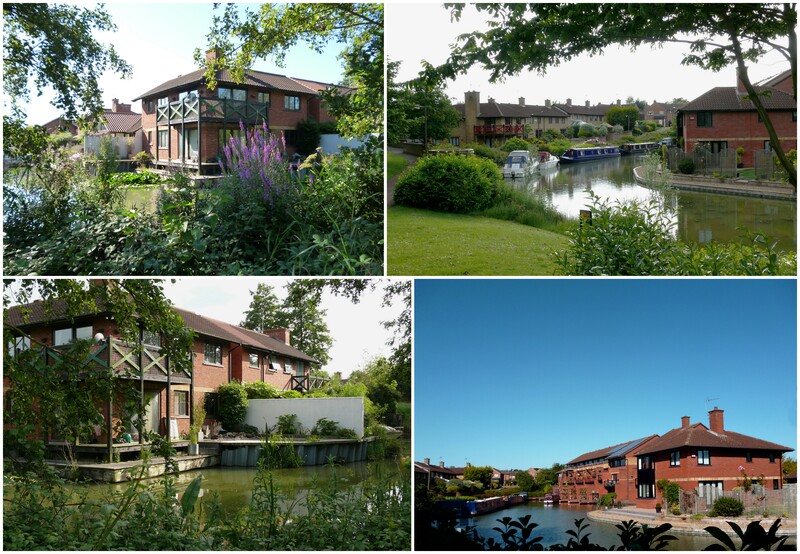 The poor maintenance of infrastructure and building fabric remains woefully inadequate but the landscape continues to give this area a real environmental boost basically because it mostly looks after itself. What a shame that before selling the properties some long term strategy could not be created in an attempt to encourage and help the new owners to understand their role in maintaining their houses to enhance the original intentions and consistency required for a healthy and safe community living in a nice place. 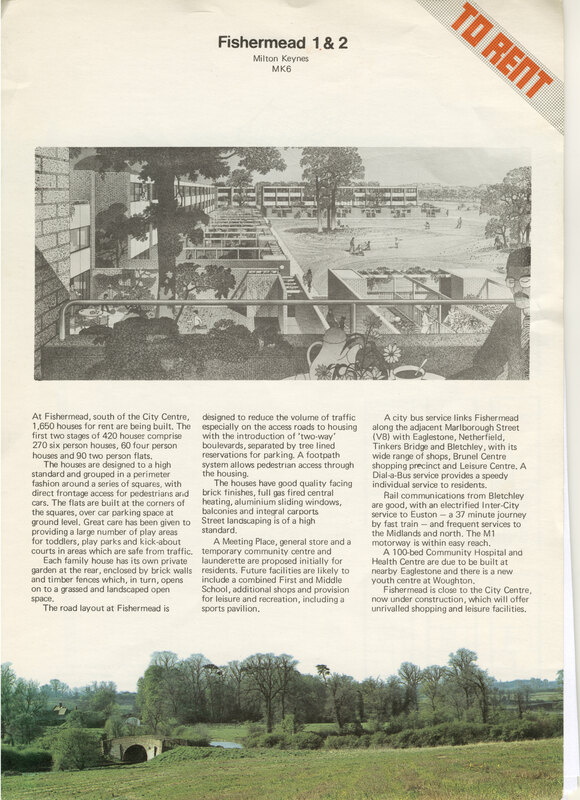 The B&W photos, plans and some of the information is attributable to an article by Michael Foster in AJ of 11th May 1977. Old photographs are taken by Martin Charles.